Just a friendly reminder that we have our first gig of the Academic year tomorrow at Leamington's classiest drinking establishment, Kelsey's! This will be the first live music event there since the refurb, so Bandsoc get to really break the stage in(please don't actually break it, I don't want to lose my job). We've got, Instinct, Framed, Grain Death and Meeting Chico playing tomorrow, free entry, doors at 8pm. For any freshers or people coming from campus, some exec will be about at the bus stops at 7.15, easily identifiable in their dashing exec polo tops, to help people find their way to the home of the Eliminator! A warm welcome to future students! To anyone lucky enough to have got themselves a place at Warwick this year - congratulations!! 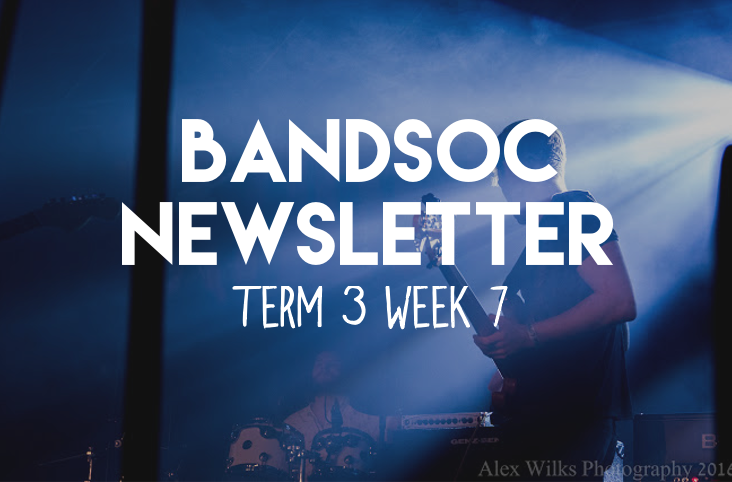 Bandsoc is the place at Warwick for anyone who loves live music. We're already planning loads of exciting events for the start of term to make it easy for anyone to get involved and get a band together - so if you want in on this, make sure you give us a like here on Facebook, and check out our website & our Instagram! We'll also have a stall at the Freshers Fair so make sure you come and say hi to us then! Unfortunately we have had to cancel the Kasbah gig we were planning for Week 8 , but we're replacing these with 2 gigs in Week 9! On Tuesday we will be hosting a gig at Stewarts TapHouse again, and then Thursday we will be returning to Robin's Well. If you wish to play at either of these which will be 30 min slots, please email/Facebook in quickly as slots will be gone pretty quickly. Also we are looking for acoustic acts to play at a Summer BBQ gig hosted by the Christian Union on Friday Week 9, so again message in if you want to play. Again we've added in a couple new features to the Practice Room so keep on respecting the room we're keeping set up with pristine kit for you guys. Week 10 we will be hosting the legendary annual gig that is Last Exit - A last gig for bands that will be graduating this year. Keep this in your calenders because it is certain to be an unforgettable night. Week 5 is upon us and that means exams have started for many of us :( Good luck to all of you and best of luck to all those who have already finished! Think this serves as a reminder of the importance of a way to destress e.g. get excited for Week 8 Kasbah gig! BOTB 2015-16 Final photos have now been uploaded so head to the Facebook page to relive this fantastic night! Thanks to Alex Wilks photography for this. There will be no all-society meetings over the next two weeks due to exams, but we will still be selling credits at the SUHQ from 1-1:30pm on Wednesdays. Remember this is your only opportunity to get credits so make sure to turn up! This week our VP Ed will be selling these so look out for him, but from next week again it will be back to Ege. Today Bandsoc will be hosting their first gig at the newly refurbished Stewart's Taphouse (formally the Undergraduate). Bands to arrive from 7:30pm, doors open from 8pm and bands to start playing from 8:30pm - 11pm. Performing will be : Eli Gumble, The Hazels, Musing Blue, Draper and Framed. Come support these amazing bands and take a night off the library #topbandssoyoubetterbethere. As per usual to collect credits make sure you come to the All Society Meetings at 1pm on Wednesdays in the SUHQ. Your only opportunity to get them and to get priority gig slots so make sure you talk to Ege! Again, make sure you get to these opportunities for a night off of top notch music, bandsoc bant and another to reason to down some drinks. You can check out the judges comments from the heat here and hopefully the RaW recordings from the night will be available soon. This should be an incredible finale to what has been a fantastic Battle of the Bands and it would be great to see you all there! You can weigh in on who you think will emerge victorious here and take part in our BOTB 2016 Oscars here. Our new exec has been elected in, so here are the lucky folks you've chosen to lead this society to greatness over the next year! Please be kind to the newbies as they learn the ropes, and thanks for voting them in! In case you’d forgotten in all the Semi Final excitement, tomorrow (04.03.16) is our Bandsoc AGM, which will be taking place at 7pm in SU Meeting Room 4/5. This is your annual chance to have your say and choose who you would like to be running Bandsoc for the next year, so please come along and cast your vote! If you would like to run for an exec position but are yet to do so, there’s still time; the deadline for announcing your candidacy is the end of tonight’s Semi Final at 11pm, and you can run for up to 3 exec positions here. As we’ve received a few messages from members of the society who will be unable to make it to the AGM (and we appreciate that some of you probably have more exciting things planned for your Friday night) we’re allowing voting via email. Just email us at su260@warwicksu.com with your name and the candidates for each exec position ranked in order of preference (1 for first choice, 2 for second, RON for re-open nominations, etc.) - a template will be sent out to make things easier as soon as applications close tonight. Email voting will open tonight at 11pm and close at 6pm tomorrow, an hour before the elections take place. It turns out that voting through email in society elections is against SU policy (thanks to the former exec for cluing us up on this) and as such we're no longer going to be hosting votes through email. Sorry about this. We're looking into other ways that absent members may be able to cast there vote (i.e. phoning in) but as things stand, the AGM will take place tomorrow as planned, simply without email votes. With the Semi Final and Final of Battle of the Bands fast approaching, we will once again be allowing participating acts priority in booking practice room slots in the week leading up to the event. Bandsoc Exec will be in the SU between 12 and 1pm this Friday (26.02.16) where acts competing in the Semi Final can drop by and book two slots each on a first-come, first-served basis. The same will happen the following Friday (04.03.16) in order to allocate slots for the Final. As soon as the competing acts have chosen their slots, bookings will re-open for all Bandsoc members as usual. If you are one of the acts entitled to priority in booking slots but are unable to meet with exec at the allocated times, just let us know and we should be able to sort something out; we're nice like that. As always, huge thanks to all those who came along to watch - especially considering that it's reading week - and congratulations to all the acts involved, particularly Eli and Jack who took the spots in the final and the semi final respectively. The judges comments from last night should be on the forum by tomorrow afternoon, and don't forget to keep an eye out for the RaW recordings which should hopefully broadcast at some point this week. This looks set to be another great heat and we hope to see as many of you there as possible! Feel free to weigh in on which of the bands you think will be claiming a slot in the final here on the forum. Although it feels like we only took over yesterday, the imminent end of Battle of the Bands - tragically - means that it's time for us current exec to hang up our boots and make way for some new blood. 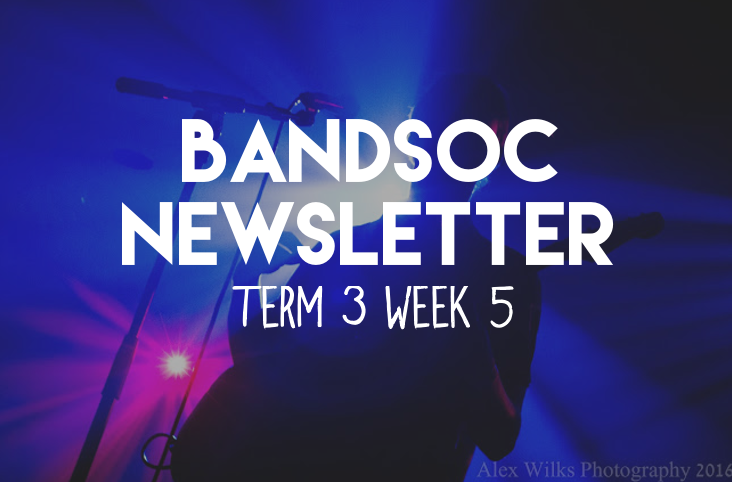 We will elect our new exec at the Bandsoc AGM which will likely take place at the end of Week 8, and if you feel like becoming part of the exec might be of interest to you (which it definitely should be), you can put your name forward for one or more exec positions here on the forum.